These handcrafted frames are built specifically to fit our stock item signs. There are five different sizes in four different colors. 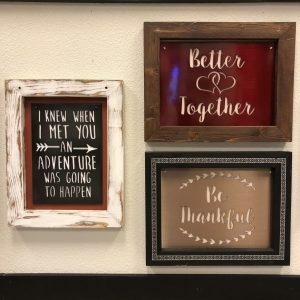 Handcrafted locally and sold exclusively at JDH Iron Designs, these frames will fit the assigned JDH Iron Designs piece with or without a backer as indicated on the design page. These frames are crafted locally so there may be a time when they are out of stock. You will still be able to purchase these frames. You will be notified when placing an order for a frame that is currently out of stock. Please add 2 weeks to the standard 2 week delivery time for back ordered our out of stock frames.